Richard Herring, Brett Goldstein and Mae Martin try to revive the world of dating back to its Cilla Black heights. An incredible show that blew everyone away at the Fringe this year; Bo combines musical comedy, stand up, theatricals and a healthy dose of cynicism to create an amazing show. SOLD OUT. One of my favourite shows from the Fringe this year, Fosters Award nominee Nick Helm presents a high impact, incredibly funny show in a desperate bid to win the award this year. With Stuart Goldsmith, Mark Dolan, Alistair Barrie, Nick Revell and Patrick Morris. 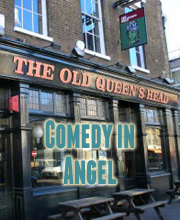 Phill Jupitus, Kerry Howard and Greg McHugh go head to head against a disembodied voice, resulting in ‘comedy mayhem’. ‘Britain’s greatest anti-comic’ (Guardian) brings his Fringe show to London. Original and very funny. Brand new show from Frank Skinner.